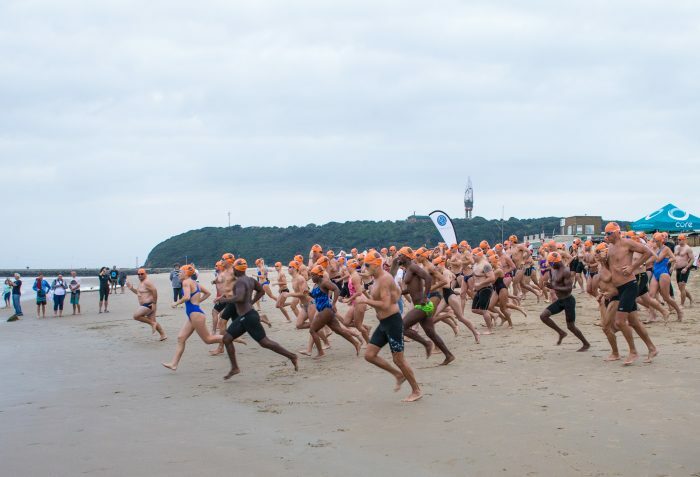 Despite the cold front which descended upon the KwaZulu-Natal coast, a record 143 swimmers braved the Indian Ocean on the morning of 13 May to compete in the fourth annual Four Elements Ocean Challenge. This year saw Julian Taylor taking the top spot in the Open Category for an impressive third year, while Sanele Nxumalo clinched the second spot again this year. Nxumalo did, however, take first place in the newly-introduced Lifeguard Category while Sasha-Lee Nordengen-Corris – the 2015 Open Category winner, international open water swimmer and South African lifesaver – placed third overall, first in the women’s division. Taylor, who is also a former national surf-lifesaving captain, said this has been one of the most challenging open water swims on the calendar in South Africa. Nxumalo, who is three-time Lifeguard Endurance Champion, winner of 2016 Miway Surf Swim competition and Lifesaving Ironman as well as a silver medallist winner in the senior men’s surf swim category at the SA Stillwater Nationals, was thrilled to have placed in the top three. “All I can say is that the swim was a lot faster than anticipated, but I’m happy with how I swam and how my fellow Durban Lifeguard team members did as well,” said Nxumalo. CEO of Four Elements, Olivia Taylor, established Four Elements Conservation NPC – a non-profit environmental preservation organisation – five years ago at the age of 14. This is a notoriously challenging race that puts even the best swimmers to the test. The 143-strong group set off from uShaka Beach in the early morning, accompanied by a pod of dolphins, with the course being changed from a finish at Country Club Beach to a loop out to Dairy Beach and back to uShaka Beach. Two competitors were pulled out the water early on because of cramp and hypothermia, with another competitor treated for hypothermia at the end, however all three made quick recoveries. The Four Elements Ocean Challenge is the only ocean swim of its kind on the KwaZulu-Natal coastline, held annually in support of World Oceans Day on 8 June, a day dedicated to raising awareness and funds for ocean conservation. This year money raised from entry fees to the Four Elements Ocean Challenge will go towards the launch of an online education programme focusing on environmental entrepreneurship for youth.